The trees in your garden can be beautiful and offer shelter all year round, but that doesn’t mean that they can be without their problems. If you’re living with any of the following issues, you may well need the services of a Winter Park tree service company. Take a look and see whether you’ll need our services today. Storms can really do a number on your home, and your trees are no exception. If lightning strikes, you can expect at least some of the branches to die, if not the tree itself. Sometimes the tree trunk will split, making the whole tree a hazard. Rather than dealing with it yourself, it’s often much more advisable to bring in an expert to remove it for you. Branches can get in the way of almost anything, depending on where the tree is growing. It may be overshadowing a window, meaning you can’t get any natural light into that room. It could also be growing into nearby power cables, making it a hazard that needs to be removed. Calling in a tree cutting service means they can do this safely, with no danger posed to you or your home. Sometimes part of the tree dies, but the tree itself is still fine. Those dead branches are a hazard though. As they’re dead, they could fall at any time. That means they could pose a threat to your family, pets, passerby, or even your car, depending on where the tree is. Tree cutters will come in and remove the dead branches safely, without causing damage to the rest of the tree. That means you get to keep the tree, but you won’t be in danger of falling branches any more. It’s not just the weather than cause damage to a tree. Infestations can also harm it from the inside. There are plenty of warning signs, such as the leaves beginning to die, or acorns becoming malformed. If this is the case, call in a tree service. They can perform an insect spraying that can remove the infestation and hopefully save the tree. It’s much better than having to remove the tree entirely. If you’re looking to get your tree trimmed, you may be concerned about what happens with the waste that’s created. Other tree trimming services may just cart your waste off to a landfill, where it will just take up space. Not us, however. Here at Advanced Tree Pros we’re committed to being eco friendly. That’s why we don’t just take the garden waste away for you, we recycle it. 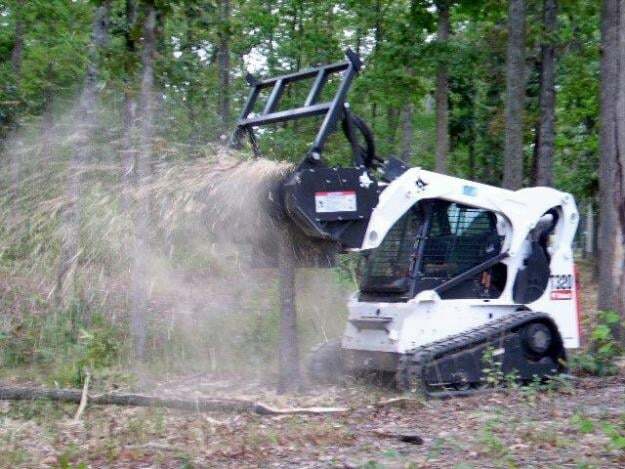 Anything we cut down or remove is turned into mulch, and we redistribute it around Florida. That means your garden waste isn’t going far, and it could still be helping nourish a garden somewhere else in the state! In fact, we manage to save about 50,000 cubic meters of mulch every year. That’s a lot of waste that isn’t going into a landfill. Why Have Advanced Tree Pros Tend To Your Trees? There’s a lot of reasons why you may choose us to fix your tree problems. Here’s just a few that you may not have even considered. Our prices stay low: We don’t charge the earth for you to have your trees trimmed or removed. That means that you don’t have to worry about the price when an essential job needs doing. You shouldn’t have to be concerned about the price of your home’s safety. Free estimates: Speaking of price, we’ll come and check the job for you, and give you a free estimate as to the cost. You won’t have to a pay a penny to consult with us. Safe working: Our team are all highly trained and so will be able to trim your trees safely, no matter how tall they are or how big the job is. You’ll know that your family and your home will be safe during the procedure. We’re insured: You should never hire a Winter Park tree service without knowing if they’re insured first. If they’re not, they could be putting you in danger as they work. We’re insured and proud of it. You can ask to see documentation if you’d like. That way, you know we’re legit. We care about our work: We’re committed to saving trees and the environment wherever we can. We’ll do our best to keep your trees healthy and growing for years to come. There’s a lot of reasons why you may need someone to come and trim your trees. Give us a call the next time you need someone. We’ll be able to give you a reasonable price on getting it done.